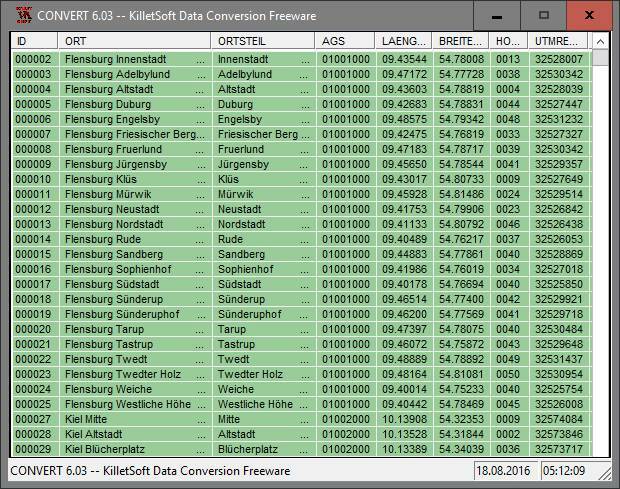 The database tables contains geodata of the Federal Republic of Germany with geo referenced towns, municipalities, town quarters and other administrative units, postal codes, telephone preselections, nature areas, landscapes, climatic zones and official topographical cartographies. The data contain coordinates for navigation and geo-coding, proximity searches and distance computations and are prepered for the spatial mapping of environmental information. Quite often it is necessary to reference an address field e.g. like town or municipality name, postal code or telephone preselection, to corresponding geographical data and coordinates - a Geo Reference. The geo reference can be used e.g. to direct a customer to the closest store locations of a retail store chain by doing a proximity search. Another possibility it to determine distances between the different objects of the database tables with the included geo references. With the elevation data from a Digital Elevation Model the ground level height of each place can be determined. Often the knowledge is necessary about affiliations and relationships between data derived from different hierarchies. So it can be determined to which federal state, governmental area or governmental county a town, a postal code or a telephone preselection is associated. It is possible to assign a variety of natural and scenic information to each town or municipality. The snow and wind load zones and solar irradiation are available as local climatic data. In conjunction with the ground level heights they can be used to calculate static loads for the planning of building constuctions and to calculate solar installations. Databases: 11.500 Towns and Municipalities, 108.000 Town Quarters, 31.000 Postal Codes, 19.500 Telephone Preselections, all with geo references, 400 Administrative Countys, Administrative Districts, Federal States of Germany, Landscapes, Nature Area Classification, Snow and Wind Load Zones, Solardata, Cartographies.